From how to harness the amazing power of search, to how to get the most out of cloud computing, to tips for minimizing distractions and better integrating work and life, Getting Organized in the Google Era is chock-full of practical, invaluable, and often counterintuitive advice for anyone who wants to be more organized and productive — and less stressed — in our 21st-century world. Our brains and our work lives are often out of synch, according to authors Douglas Merrill and James Martin. Our nine-to-five workdays and our cubicle-based workstations are no longer helping us get done what we need to do. It’s no wonder that we have trouble organizing ourselves to win the game when the entire playing field is poorly designed! Thankfully we have some new tools to help us manage our time better and do our best work. In Getting Organized in the Google Era, the authors compile hundreds of useful tips for getting more from our time at work and home. Merrill knows this territory well. 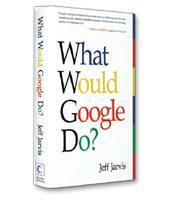 Before he was the chief operating officer of new music at EMI, he was the chief information officer at Google. Before that, he worked as a senior vice president at Charles Schwab and an information scientist at RAND. With a Ph.D. in cognitive science from Princeton University, he understands the human brain and the ways new tools can help to keep it sane amid today’s technological tumult. As a person with dyslexia, a learning disorder that causes the brain to reverse numbers and letters, Merrill has great empathy for people who are struggling with getting things organized. While researching the subject of brain cognition, he learned that the ways our brains are hardwired often work against what we are trying to accomplish. This makes getting organized an often difficult undertaking. Through his research and his work, he learned a vast array of techniques for getting past limitations and focusing on the right information. Now, Merrill and Martin have arranged these work tactics into a book that helps others get their own work and personal lives in order. 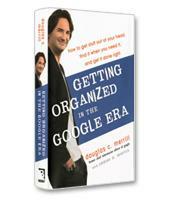 In Getting Organized in the Google Era, the authors break down the difficulties of getting organized in today’s information-saturated world into three parts. The first focuses on the individual and the hurdles we each must overcome to get to the goals we’ve set for ourselves. Some of the options discussed by the authors offer an alternative to traditional management philosophy. While not for every workplace, some of the ideas about scheduling and time management could be a good fit for selected workplaces. The larger point that the authors make is that we, too, often try to get our work done within outdated systems. Questioning these systems and discovering new ways to revise the work structures in our lives to better fit our current circumstances can be great ways to start getting our lives organized. After evaluating the personal side of the organization equation and concluding that clearer goals can help anyone break through personal constraints, Merrill and Martin move into the organizational side of the problem. This is where they point out the beauty of search and venture into the possibilities of the paperless office. First, they explain the benefits of digital files and show how eliminating paper from your work reduces clutter, creates a cleaner environment and makes information easier to share and access. Then, they list the important reasons why we should all make the awkward transition to better digital tools to improve how we manage our calendars, e-mail, documents and lives. The third part of Getting Organized in the Google Era addresses smarter ways to stay focused during our daily battles with more and faster information. A chapter on balancing work and life offers this important thought: It cannot be done, since they are so deeply intertwined. A better way to think about the issue, Merrill and Martin write, is to integrate work with life instead. Adjust your habits to fit "what your workday actually looks like, rather than trying to organize your life around the way you think it should be." What makes Merrill and Martin’s book so enjoyable is its wonderful combination of humorous storytelling and helpful hints for conquering many of life’s most common problems. Add to that a casual sprinkling of song lyrics and real life experiences, and the result is a powerful book about using the latest tools for time management to your greatest advantage.